Hollywood movie stars Kate Hudson and Owen Wilson are reportedly keen to start a family. The couple split up in 2007, but have recently been seen on holiday together in Paris and Normandy, which has led to rumours that they are an item again. A friend of the pair claimed that they got back together around three months ago after realising they could not bear to be apart. "It was a stumbling block previously with Owen. He's always had a difficult time committing, but this time it's different," said the source. "Kate was with him throughout his recovery and that made Owen realise how much he loves her." The insider claimed that the Fools Gold star is keen to have a brother or sister for her first child from her marriage to Black Crowes frontman Chris Robinson. Wilson was involved in an alleged suicide attempt shortly after splitting from Kate in 2007. Got a baby on the way? Check out these personalised gifts, there's prices to suit every pocket. 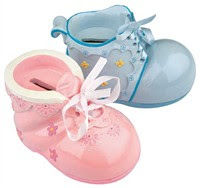 This ceramic shoe bank money box is available in both blue and pink. Buy now and save: Was £7.99 now £3.19.